Park Plaza Block of the Month includes full color pattern and fabrics for the top including binding to complete the QUEEN size quilt 94in x 94in. This 6 months Block of the Month quilt is written in six simple steps. Each step makes a different component that, when put together, completes a stunning finished quilt. The pattern includes instructions for Throw, Queen and King size. If you wish to make this quilt King size (106" sq), we will have a fabric packet available for purchase to upsize this Block of the Month. Registration is $45.00. My model is on display at the shop! 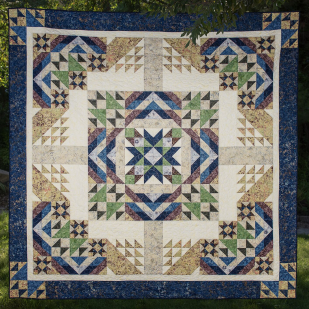 You do not need to attend the meetings to participate in this BOM but many tips and techniques are discussed at these meetings to help you create this quilt. This is a 6 months Block of the Month. Cost is $32.25 for 6 months. Dates are Wednesday evening at 6-7 pm on March 13, April 10, May 8, June 12, July 10 and August 14, 2019.